FILE - Panos Moumtzis, United Nations humanitarian coordinator on the Syria crisis, gives a news conference on the latest developments regarding humanitarian access in Syria, in Geneva, Switzerland, June 11, 2018. 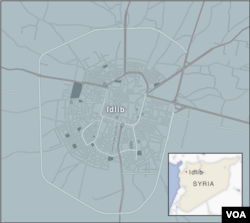 A senior U.N. official reports a readiness plan has been developed to assist hundreds of thousands of civilians trapped in Syria’s northern province of Idlib, while diplomatic moves to prevent all-out war accelerate. The U.N. Regional Coordinator for the Syrian Crisis said he has appealed for the protection of civilians in Idlib to countries of influence attending a Humanitarian Task Force meeting in Geneva. Panos Moumtzis said he has received assurances from the Russian and U.S. co-chairs that everyone was intent on finding a peaceful way forward. Moumtzis said the task force has met several times during the past couple of weeks focusing on a peaceful solution. He told VOA the role of Russia and the United States is crucial in this effort. “Diplomacy, prevention, humanitarian diplomacy, is taking place at the moment at all levels to make sure that everybody works for the same objective to avoid a humanitarian catastrophe. And, our fear that the worst may still be ahead of us that this will not happen on the ground,” Moumtzis said. 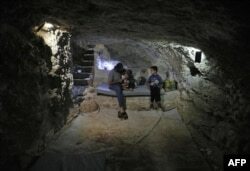 A man sits with his children in a cave that he dug inside his house to shelter him and his family as part of preparations for any upcoming raids in the rebel-held Idlib province's village of Maar Shurin, Sept. 11, 2018. Since early September, aerial bombardment and shelling by Syrian and Russian forces have increased. The United Nations reports dozens of people, including women and children have been killed and wounded, and several hospitals and schools have been attacked and put out of service. The United Nations reports more than two million of the nearly three million people in Idlib need humanitarian assistance. Syrian crisis chief Moumtzis said humanitarian agencies have developed a plan to respond to the needs of 900,000 people who could be affected by hostilities. He said everyone is hoping for the best, while preparing for the worst.